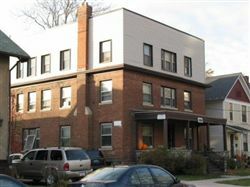 Description: 209 N. Ingalls is a three story brick building located 1.5 blocks north of Rackham Hall. This is an extremely popular location for anyone who requires easy access to Central Campus or North Campus as several bus stops are extremely close by. One of the older buildings in the neighborhood, this building is well maintained. Four of the apartments have direct access to large balcony / fire escape on the rear of the building - in addition to their front doors off the interior common hall. Each apartment comes with one parking permit. There is coin laundry in the basement. First floor - southern exposure. hardwood floors throughout. Galley kitchen with separate rear entrance. small dining area/study. Spacious living room with windows on two walls. Second floor - southern exposure. Carpeted throughout. Galley kitchen with separate rear entrance. Small dining area/study. Spacious living room with several windows on south wall. Located on the second floor, this southern exposure apartment features carpet throughout. The galley kitchen has a separate rear entrance. There is a small dining area/study area and a spacious living room. Located on the 1st floor, this apartment features bedrooms on opposite ends of the apartment and a walk-through study. There is ceramic tile on the bathroom floor and the galley kitchen has newer appliances. The apartment has a front and rear entrance and on-site parking. Second floor apartment with carpet throughout. Galley kitchen with separate rear entrance. There is also a separate formal dining room. Spacious living room with windows on two walls. Comfortable for up to 3 people - one bedroom is larger than the other. Third floor - southern exposure. Carpeted throughout. Galley kitchen with separate rear entrance, separate formal dining room. Spacious living room with windows on two walls. Comfortable for up to 3 people - one bedroom is larger than the other.